Radeen happily says, OMG, look at this store…..
We have returned to Marsh Harbour in the Abacos, sailing in from Eleuthera and the Exumas, where we were lost in the beauty for over a month. We tried to sail into Spanish Wells on the north side of Eleuthera and hoped to spend a few days exploring there with friends on IP420 Flatlander, but the weather called for us to press on to the Abacos before the north winds began to blow. Now that we are here in Marsh Harbour, we are thrilled once again with the many conveniences and services provided in this town. We are amazed by the massive grocery store, Maxwell’s and the large hardware store, Standard Hardware. These stores match any we would find in the USA, yet we are reminded that we are in the Bahamas, mon! Coming from the Exumas, where a store may be a room in a house with three shelves of limited supplies, and now being presented with such large retail establishments, is quite overwhelming. Commercialism and marketing are everywhere, and it is honestly a SHOCK. Along with this marketing we also have noticed the different attitudes of the store workers. In the Exumas, the people are calm and so happy to see you visiting their store. Conversely, in Marsh Harbour, they really don’t seem to care if you are there or not. Reminds us of the attitudes of marketing in the USA. We all can learn a lot from the people of the Exumas, how polite and calm and honestly helpful they are. That is a beautiful place in the world, with genuinely friendly people. Another thing we all do in Marsh Harbor is head off to Maxwell’s Grocery Store nearly every day. We take our rolling luggage carts or back packs and go shopping for provisions. We wheel them back to the dinghy dock where we load them up and take them out to the mother ship on anchor. Once at the mother ship, we hand the items one at a time up into the cockpit and then move them below decks where they are stored in the lockers. This task of “going to the grocery store” is almost an all day task, but it is actually fun. You walk 1.5 miles to the store, chatting with other cruisers along the way. Once in the store, it is fun to find items that are unfamiliar. You must only buy just enough for your carts so you can walk it back to the dinghy dock and get it out to the boat. It really is a fun task, so much more fun than getting into your garage kept car and driving to the store and then driving back. Here, you actually have to walk and carry all you buy, in a round trip of about 3 miles. This makes it a good activity! Currently, there are at least 8 other Island Packet Yachts at the Jib Room or anchored in Marsh Harbour. They include IP38 Slow Flight, IP40 Sunkissed, IP40 Navigator, IP420 True North, IP440 Grand Cru, IP40 Down Island, IP420 Nederluft and IP35 Island Breeze. We enjoyed meeting many of them at The Jib Room’s Cruisers’ Cocktail Party on Thursday. The sailing community is an amazing group where people help each other and are sincerely interested in each other. It is truly different than on land. I guess it is the fact that we all are living the same challenges and the same adventures that brings us all closer together. One thing is for sure….it is an interesting and adventurous lifestyle, where even going for groceries is fun! Desmond preparing to limbo low. He has been performing for more than 15 years!! Rake and Scrape is percussion via a screw driver and a saw! Yes, life on a cruising boat is SIMPLE. Imagine walking for all your food, never driving a car, jugging water to your boat, living in a space the size of your closet…..and some how…..it really is fun :-)! Our fuel system totally torn apart…..
What a diverse and challenging passage of 68 nm from Current Cut in Eleuthera to Buckaroon Bay off Abaco! First off, we had NO PLANS to make this run now. We had planned to move 1 hour up to Spanish Wells, and spend 3-5 days exploring and discovering that great area and enjoying the company of IPs Flatlander, True North, Charbonneau and others. BUT….the weather demanded us to move on north, taking the 20-25 knots of south winds. We are excited to stage up in Abaco for our good friends Wendy and Craig who will arrive April 2. Our concern of going to Spanish Wells was that all next week, it will be blowing NORTH and, even after that passes, the sea state will be 6-9 feet, making getting into the Abacos very difficult through the cuts. So, at 0600 we decided to GO FOR IT. This required us to quickly remove the dinghy motor (in the dark), the dinghy fuel tank, lift and strap the dinghy down, enter some waypoints and raise the anchor and get underway. It was a rapid “Chinese fire drill” but we have done this before, so we knew exactly what to do. Unfortunately, our text message to Flatlander did not arrive, so they did not know our change in plans. Once under sail, we were able to set a full 135% jib on a starboard whisker pole. We could have set a main for a full wing on wing, but with a forecast for serious SQUALLS, we decided that the main was just too much to deal with on this leg. So, we ran the motor at 1500 rpms, hoping for higher winds, and sailed the beautiful jib on the pole. I must say, a whisker pole is a great set up for dead down wind. We were easily making 7 knots and the passage looked quick…..until……THE MOTOR STALLED OUT! WHAT….no motor….yup, it simply stalled. This is always a FUEL problem, so naturally we thought we calculated the fuel burn wrong from Georgetown, so I poured in two five gallon jugs of spare fuel. This was not fun as we were rolling gunwale to gunwale. It was a trick keeping me and the fuel jugs onboard. After adding fuel, we started up, and sure enough it ran….for 1 minute and then stalled. OH NO…..no motor. OK, it has to be the fuel pick up tube. I pulled it and checked it,, no problem. Nope. Next I changed the Racor primary fuel filter, and now we had a NEW problem….I could NOT refill the Racor using the electric fuel pump. The RACOR WOULD NOT FILL……OH no….NOW WHAT? Ok, this means we must have a fuel pick up issue, or a fuel tank vent problem or a broken fuel pump. So, I kept tearing down the system and all fittings. THERE IT IS….the plug of crud at fitting #2 from the tank. Stupidly, I did not start at the tank and go upstream. I kept thinking: The Fuel pump died, the Racor was plugged, the de-bug magnetic filter was clogged, and I kept tearing down these systems. I even tore down our dinghy fuel line, and used the hand bulb pump which I installed into the diesel fuel system in place of the electric fuel pump. With this, I thought I could easily fill the Racor by pumping the bulb and sucking fuel from the tank to the Racor. NOPE…..this did not pump fuel either…..so….I kept moving this bulb hand pump upstream toward the tank. Of course, when I got to the second fitting from the tank, I FOUND THE PLUG of crud in this fitting! I was so happy to find it, and so frustrated that I DID NOT START THERE! Plenty of water depth….13,000+ feet deep….no worries mon! Radeen did a great job running the boat downwind in what developed into 4-5+ foot rollers and 20-25+ knot winds. She sailed while I worked on the engine for 3 hours. Lucky for us, we were in deep water, 13,000 feet, so no worries of hitting anything. We also had about 5 hours to go until the entrance. The winds were such that we could have sailed into the cut, not a good idea, but that was our only plan if I could not get the motor running. The bottom line is…..you really need to know your yacht systems so that when a break down happens, you can at least take a shot at fixing it. There’s no one to call out here! The sea state NEVER looks a large in photos. SALT SPRAY ALL OVER THE BOAT…..errrrrrr…..give me a break! …The sailing to Eleuthera was fantastic..
We really enjoyed our 4 days in Warderick Wells, but it was time to press on and sail on over to Eleuthera and into Rock Sound. The winds were E to SE 12-17 with a few gusts to 20-22 knots. With SE winds we were mostly on a beam reach and the seas were 2-3 also on the beam, so it was a dream sailing day. Our autopilot sailed us on the 30 mile crossing to Powell Point. We then sailed partway around the sandbars until we needed to fire up the motor and power into the harbor. Rock Sound is a very large harbor that is easily 1.5 miles across and there are dinghy docks and landing places for getting to shore. We were in need of water, as we last took on water in Gerorgetown, 12 days ago, and our 90 gallon tank was getting low! Yes, we made it 12 days on about 65-70 gallons of water, and we do shower everyday! We estimated our water usage at about 5-6 gallons a day total. While on anchor in Rock Sound, we jugged 75 gallons of water from the beach to the dinghy to the deck and into the water tanks. This is a bit of a task, but we have done this before and here in the Bahamas, where water is $0.50/gallon when you find free water, you take it, even if you have to carry it! The Market Place in Rock Sound, very modern! Our other task on in Rock Sound was to explore the Market, which is very modern and new. We picked up a few items like milk, cheese, yogurt, eggs, and a few snacks, and checked out with a $95.00 bill! WOW, food is expensive here in Eleuthera. Good thing the RUM is cheap 🙂 We plan to walk more of the town and discover this well known gem of a location. One thing is for sure, you can easily tell this island is far more developed than the others simply by walking the roads and the visiting the market. $7.44 for a jar of peanuts! This is what $95.00 of groceries looks like and we bought no meat! Best deal: Ramen Noodle @ $0.38 each! Bahamas…..beautiful…but the PEOPLE…. are even more so. Everyone we meet is so friendly, so kind, very calm, patient and very willing to help you. This is what truly makes the Bahamas so special. The people are wonderful! We are hiking the trails and enjoying the remote beauty of Warderick Wells for one more day before we head northeast for Eleuthera. The hiking trails are numerous and well marked with yellow paint on rocks and cairns, stacks of rocks to guide us. 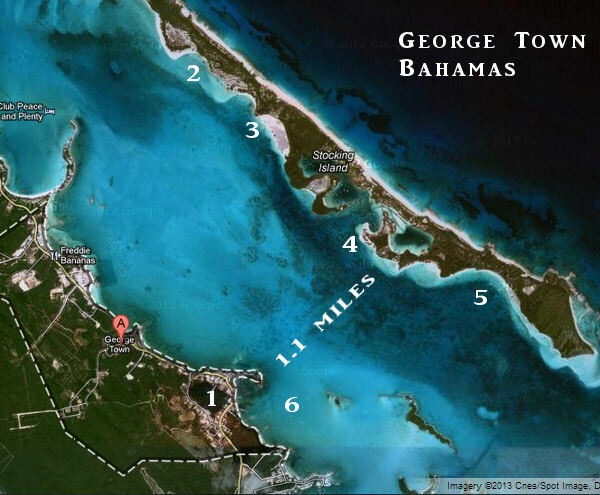 The dunes provide panoramic vistas overlooking Exuma Sound and west to Exuma Banks. From these high vantage points you can see the beautiful deep blue Sound side contrasted to the aquamarine Banks side. The shallow waters light up with a nearly white color as the sand bottom reflects the light back to the 1-2 foot surface. Navigating these waters is simple mid day by reading the color of the water. This makes it easy to see the deep waters as you approach the islands, cuts and harbors. Today we will hike a few more trails, and enjoy more beaches and maybe even more snorkeling. It is obvious why so many cruisers spend time in Exuma Cays Land & Sea Park. Volunteer extraordinaire Jen, who hails from Vermont, makes this place even more special, with her friendly and welcoming attitude. She runs the gift shop and the radio and answers at least 1,236,547 questions every day! Thank you to Jen and Andrew and the rest of the Park Crew for making this place great! It is amazing that anything can grow on these rocks! ….thank you again for sailing along, we hope you are enjoying the discovery along with us…. …That is our boat way down there…. Yes, we made it to the famous Boo Boo Hill on Warderick Wells! The cold front has brought 25 – 30 knot winds and cooler temperatures, so lots of rocking overnite and no snorkeling today. While two loaves of home made bread were rising, we had spashy a dinghy ride ashore to the Park Office. Sweet and friendly Jen gave us a map of the 18 trails on the island and a marker for making our traditional driftwood sign to leave on top of the hill. Little did we know how elaborate some of the signs would be! The path was clearly marked and very informative, with large, well-made signs explaining how the water table works (a thin fresh water layer on top of salt water keeps the plants alive in the dry season) and the differences between red, black and white mangroves (red mangroves are in the saltiest areas, have blossoms with no fragrance and excrete salt through their roots). After fording Banshee Creek, we climbed up the hill, watched the blow holes and the crashing waves on the ocean side and then pressed on to the top. We added our simple sign to the multitudes there, most dated from 2009 till the present. The views of our boat on the mooring ball were incredible – see photos below! Our reward for this effort was warm bread and soup for lunch! As soon as theses frontal winds dies down, we will be making a crossing over to Eleuthera and moving into Rock Sound where we will take on water and spend time exploring that Island. This place is just too beautiful and we really appreciate the people who had the foresight to preserve the entire Exuma Cays Land and Sea Park in the 1950s! The Park is 22 miles long and covers176 square miles. It reminds me of the similarly stunning beauty of Acadia Maine and our explorations there. Today, we snorkeled three reefs and spent the day mostly in our wet suits, fins and masks. We were in the water at 0930 this AM on Judy’s Reef and there we swam with a six foot spotted eagle ray! From there we moved to the lesser current of Emerald Rock where we observed some large groupers and angel fish. After lunch, we snorkeled the reef near the office and swam with a five foot green turtle, which was surprisingly fast, and many truly large lobsters. Exuma Cays Land and Sea Park is a world treasure. After the day of snorkeling, we walked the low tide sand bar just off our boat on mooring ball #11 and then had cocktails and snacks with Cliff aboard IP-40 Navigator. Truly a dream day….Life is GRAND aboard a cruising sailboat! This place,Warderick Wells is AMAZING! What a dream place this is. We are so lucky to spend time exploring and learning about the Exuma Cays Land and Sea Park. Thank you so much for sharing in our adventures. Working the GoPro camera on a boat hook…Blaine style…..
Today was a dream sail, and a lazy sail, as we set the jib to port and put up a whisker pole for a dead dowwnwind sail in 15-20 knots from Big Majors Spot to Warderick Wells. This places us right in the middle of the Exuma Land and Sea Park and at the park’s office where we had the pleasure of meeting Jen, the most patient girl you will ever hear on the radio. Jen’s job everyday at 0900 is to manage the three mooring fields and assign mooring balls to waiting yachts. You can radio in the day before and request to be placed on the waiting list. At 0900, Jen takes over channel 09 and inquiries which yachts are leaving, or have left, and then systematically and calmly assigns yachts to the various moorings based on length and draft. There are yachts here 100 feet long on mooring balls! Most are 40-50 feet. Radioing in from Big Major Spot, we were on the waiting list and once underway, we were assigned mooring ball #11 in the north field near the Park Office. The sailing, dead down wind, was a real treat as well, and we easily slipped along at 4.5 to 5.5 knots with the jib poled out. A few hours later, we turned the corner at Warderick Wells Sand Bore and sailed a beam reach right up to the entrance. Radeen motored us into the creek and past the many moorings. In the strong current, she placed our bow directly over mooring ball #11 so I could connect our mooring lines. We are HERE….Warderick Wells, part of the Land and Sea Park established in 1958! We deployed the tender and motored into the park office, where we checked in. Amazingly, we bumped into Debbie “Blondie” and Dennis owners of IP420 TRUE NORTH. Wespent last winter with them in Marathon, Florida, at Harbour Cay Club and in the Abacos. After tomorrow, they are heading south as we are heading north. It was great to visit with Island Packet Friends! Tomorrow, we plan to snorkel some the many reefs around the park. Then the frontal line will arrive late at night with NW, then N winds of 20-25 knots. We plan to hike the trails and explore the island when the winds will keep us from snorleking. Once the front passes, we will head north to Highbourne Cay or maybe make a run for Eleuthera. Anchored with the swimming pigs a safe distance away…. We dropped anchor off the beach where the swimming pigs live; yes, these pigs can swim! From this spot, we have explored Staniel Cay and the famous Thunderball Grotto! When anchored off Big Majors Spot, it is about a 1 mile dinghy run to Staniel and the Grotto. The advantage to anchoring here is the protection from the east winds and the currents. There are over 45 boats here and some more than 100 feet long. I can see why so many people spend time here, as the beach is great, the swimming pigs are fun, and the Grotto is spectacular. Staniel Cay has a nice yacht club pub and restaurant and a few settlement stores and shops. Again, you are reminded that you are in the Bahamas when the store is two 10′ x 10′ rooms. But, hey, you did not come here to shop, you came here to swim, snorkel and discover the beauty of the Bahamas and the gracious people. My favorite way to share a location is via my photographs. I will allow them to tell the story…. a Trumpy motoryacht built in Annapolis. Imagine climbing this after a hurricane and fix the wires! What a beautiful day in beautiful water in the beautiful Exumas….this place will ruin you for sailing and boating ANYWHERE ELSE! Tomorrow, we will move onto Warderick Wells in the heart of the Land and Sea Park. So much to see….and we LOVE IT…. We have enjoyed our first time exploring and discovering George Town, Bahamas. This is a great place for cruisers to base because there are many places to anchor and to be protected from the cold fronts that arrive nearly every week. When a cold front arrives, the normal east winds will be pulled to the south, then southwest, then increase as they build blowing from the northwest. This northwest wind will then move around to the north and eventually to the northeast where it will really howl and then blow itself out. Once the front has passed, the winds will move back to the normal east winds and all is fine once again. When you look at this map picture of the George Town harbor below, and if you think about this frontal passage and the wind directions, you will see that there are various places to move to when dealing with these fronts. Or you can simply stay put and ride it out for a day. #1. Lake Victoria. The heart of the town. Dinghy dock, Exuma Market, Fuel, water, trash, recycle! #4. Chat n Chill plus St. Francis Resort, this is the center of the action and where Volleyball Beach is located. #6. Kidds Cove, where you anchor when you want to service your boat by jugging fuel, and water, or stocking up on groceries from the Exuma Market and local produce stands. The dinghy ride across the harbor is 1.1 miles and in a blow this can be a real rough and wet ride. We normally put on foul weather jacket and sometimes bibs, so that we are not soaked after the crossing. In Feb 2013, there were nearly 300 boats at anchor in George Town harbor. With all the services, great beaches, pubs and town access, I can see why so many cruisers make this their winter home!